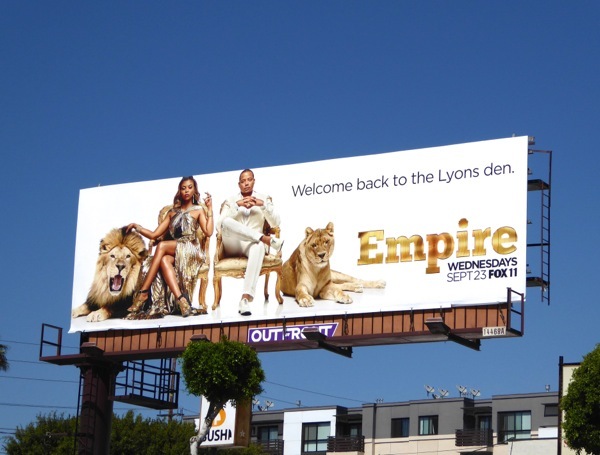 Empire totally owns the skies with this golden sophomore season billboard welcoming us all back to the 'Lyons den'. 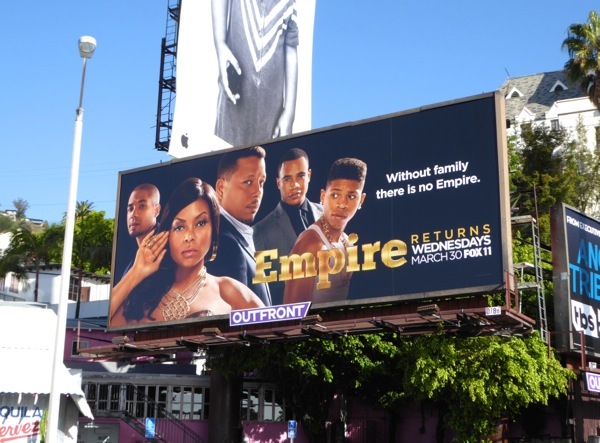 Can music mogul 'Lucious Lyon' (Terrence Howard) retain control of his empire and rebuild his family from behind bars, or will 'Cookie' (Taraji P. Henson) and their sons and enemies continue to scheme to steal Empire records out from under him. 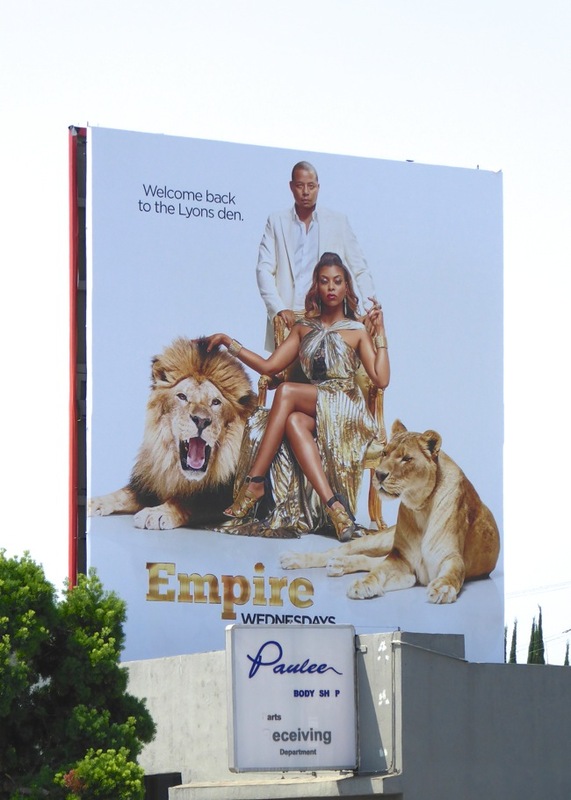 This fierce season two portrait billboard for Fox's multi-platinum hit series was snapped along La Cienega Boulevard on August 19, whilst the regal landscape version was captured along Santa Monica Boulevard in West L.A. on August 29, 2015. 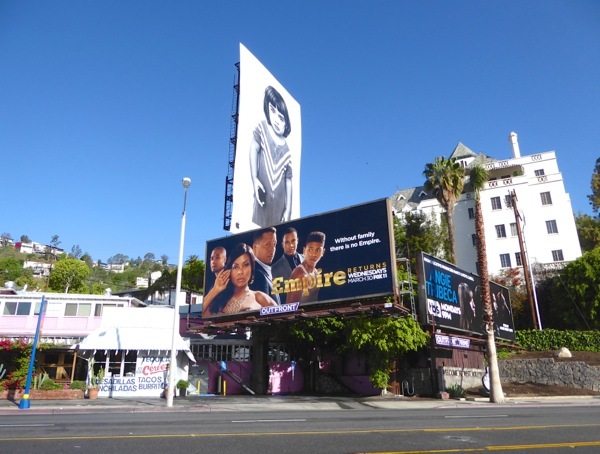 There's something about these ad creatives that also reminds Daily Billboard of these House of Cards season two billboards, but maybe it's just because they both feature scheming power-hungry couples. 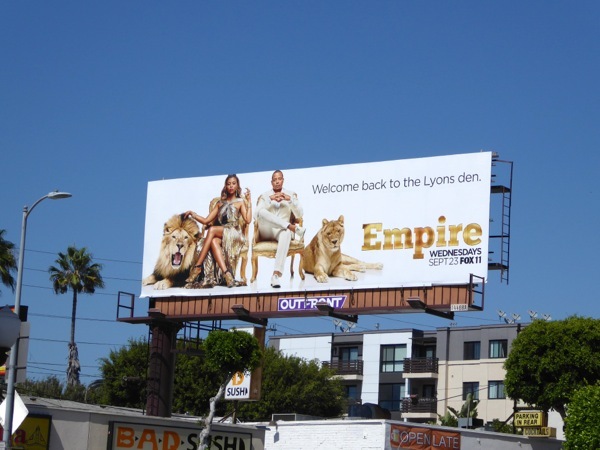 If you're a fan of the show, be sure to also check out these Empire season one and 2015 Emmy billboards. Now get ready for another wild season and "don't forget to thank your Cookie on this historic occasion!" 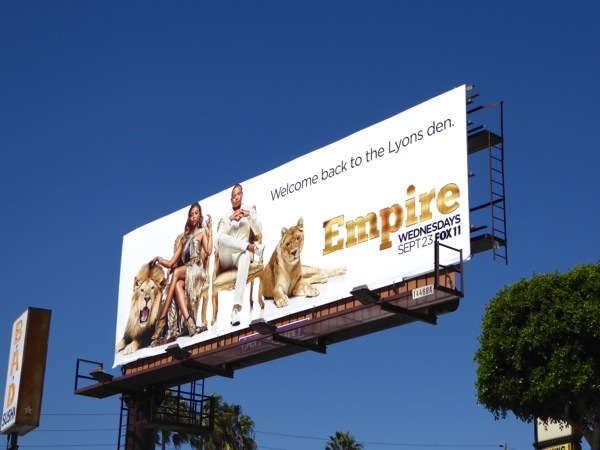 UPDATED: Here's another example of the portrait billboard creative in better lighting, showing off the Lyons in all their golden glory. 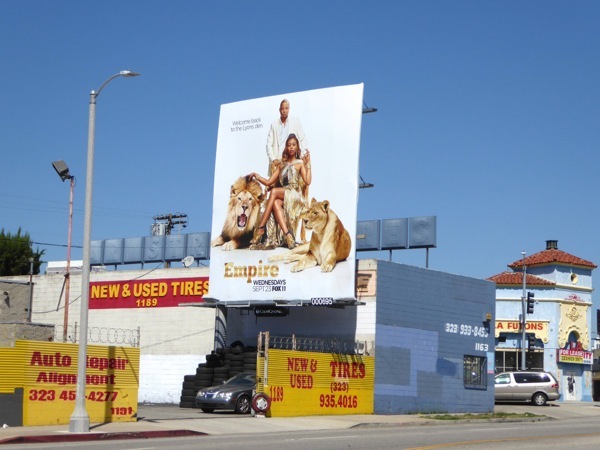 This fun second season creative was snapped along La Brea Avenue on September 19, 2015. 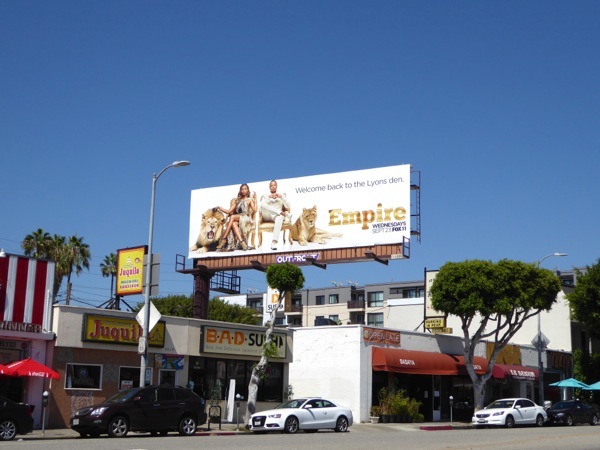 UPDATED: With only a few episodes left in the sophomore season, here's some extra ad support for Empire snapped along Pico Boulevard on November 16, 2015. 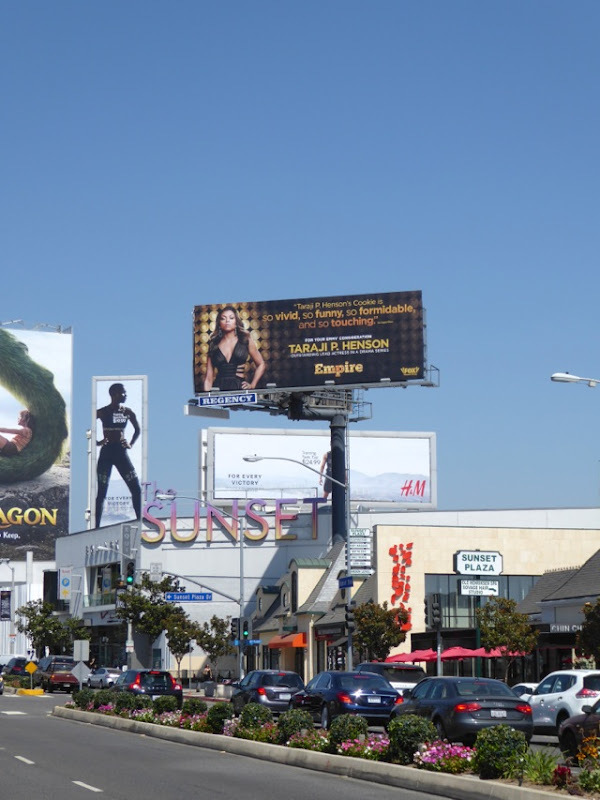 As you can see the season two ad creative works equally well with a black background as with a white background. UPDATED: Here's also the midseason key art for the returning show with the whole family in the spotlight. 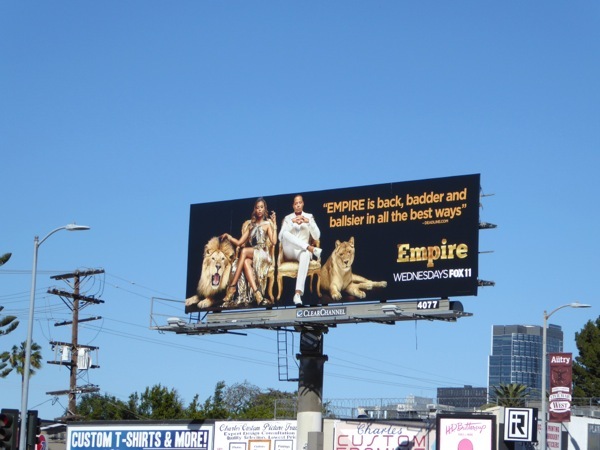 This midseason two Empire billboard was snapped making an impression along the Sunset Strip on March 6, 2016. 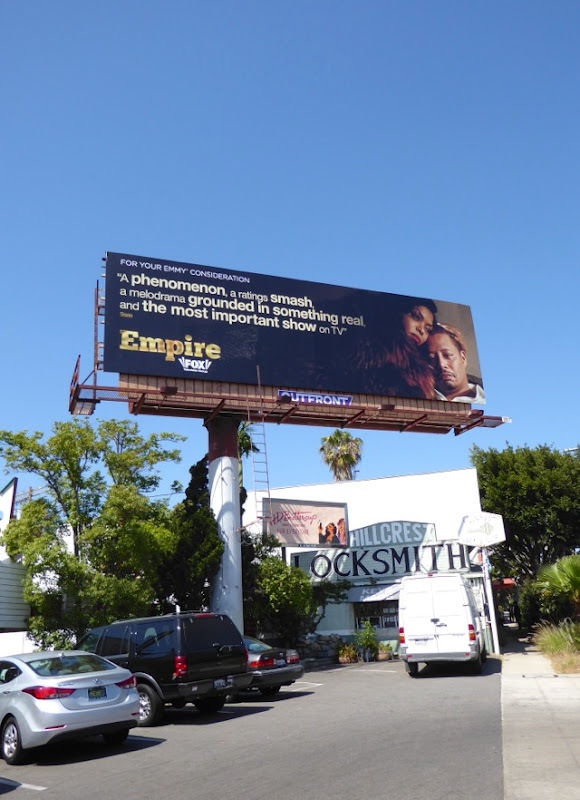 UPDATED: Here's also the second season Emmy consideration billboard for Empire, snapped along Pico Boulevard on June 2, 2016. 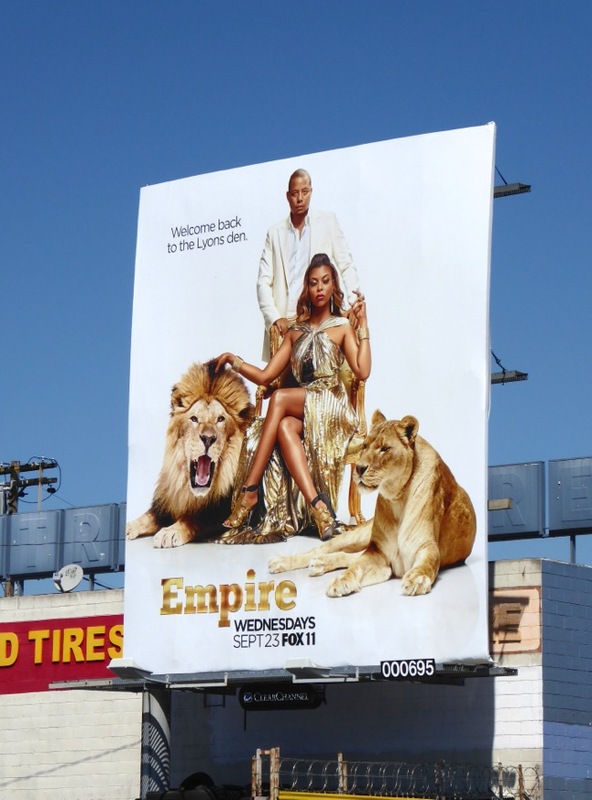 Last year the buzz-worthy show received three Primetime Emmy nominations, what will happen this year? UPDATED: Taraji P. Henson once again secured an Emmy nomination for her role as 'Cookie Lyon' for Empire's sophomore season, but can she add the accolade to the Golden Globe she already won earlier this year? 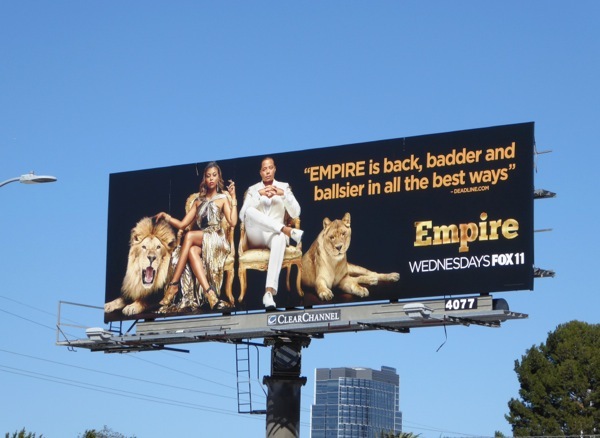 This Emmy nomination billboard with its flattering quote from the L.A. Times was first spotted high over West Hollywood's Sunset Plaza on August 3, 2016. UPDATED: Fans of the show can also check out these original costumes from Empire on display.